I checked, this weekend, just to make sure I hadn’t gone through the looking glass. This Nationals team, off to the franchise’s best start in its short history, is entirely different from last year’s not-so-lovable losers. The Nationals this season are playing ball like they mean it; they’re focusing on the unglamorous but pivotal concepts of pitching and defense and eschewing the long ball in favor of small ball. The Nationals have lost just three series this season so far, two to the Phils and one to the Marlins, and have yet to lose more than twice in a row. Better than that, there’s something alive in the Nationals Clubhouse. Asked after Tuesday’s win over the Braves, Riggleman spoke to the team’s immense frustration at coming back with a 3-3 record on the short trip, and their desire to do better. A year ago, a 3-3 road trip to Atlanta and Miami would’ve been met with satisfaction from our band of losers. This is not that club. The Nationals are putting on clutch performances before small crowds, putting together wins out of the barest of materials. Sure, we have the best closer in the league so far, in Matt Capps (13 saves! ), and the league’s win leader is Tyler “The Vulture” Clippard with 6 wins, and ¡Livan! is #2 in ERA at 1.04. Nyjer Morgan is leading the league with 5 triples, Zim’s 11 doubles put him third in the league. Flashy? Hardly. Flexible? Definitely. The Nats are doing their dead level best to make their comparatively small payroll do the work of a bigger budget. So far? The Nats have as many wins as the New York Mets, whose $132M payroll is more than double the Nats’ $61M budget. 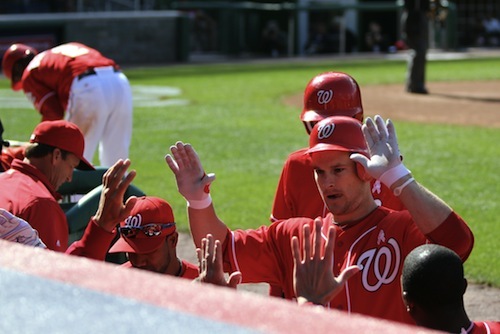 See you at the park next week when the Nats take on the Mets and the Orioles. D.C. United played last Wednesday night at RFK against Kansas City and avenged their cruel mistreatment in the Wizards’ home opener in April, picking up a 2-1 victory at home and breaking their longest home scoreless streak in team history. Striker Danny Alsopp had both strikes for United against KC, and became the first Australian to score in MLS play I had hoped that United would take that momentum and turn it into a victory over FC Dallas on the road this Saturday, but instead they dropped another match, and got shut out yet again. Not all is bad, though, and there’s still a chance that this franchise could compete, if they can get their attack together, and if they continue to keep Bill Hamid in goal and get him fire-tested. Hamid is now 1-1 in two starts, and has given up just two goals, his save percentage is a good 20% higher than Troy Perkins’. United’s problems are clear and upfront, and the team’s definitely working on solving them. The move to bench Perkins for Hamid could’ve come sooner, in my opinion, but it’s hard to make that kind of change in the early part of the season to someone as veteran as Perkins. United takes on Colorado (3-3-1) at RFK on Saturday evening at 7:30.